People are going to be spending millions of pounds to play games on their mobiles by next year, say experts. Mobile gaming is seen by many as the next big thing, as phones become more powerful and come with colour screens. "This has been a very good year for mobile gaming," said games consultant Robert Tercek. "With what's happening in Asia, Europe and North America, we're well on track towards a billion dollar market in 2004," he said. This is good news for mobile phone companies, which have become increasingly desperate to find ways of getting more money from their subscribers. They are looking at how to get people to do more with their mobiles. But Mr Tercek of the digital media consultancy Machines That Go Ping said the growing popularity of mobile gaming would require a new way of thinking for the phone operators. "They are used to thinking of just minutes, of just voice," he said in his opening address to the Game Developers Conference Europe, being held this week in London. "Operators are not used to data, especially in the US." 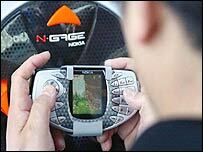 Games for mobiles are different from those played on a PC or a console like the PlayStation 2. They are designed to appeal to people with a few minutes to kill waiting for a train or bus. Mobile gaming has already proved immensely popular in Japan, where people are happy to pay to download relatively simple games that can be played anywhere. "We've seen the first real signs of a worldwide marketing opportunity," said Mr Tercek, pointing to several key developments in mobile phones over the past year. 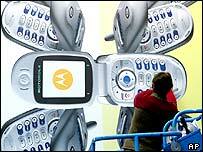 These included the development of new technology like Java to create for games for mobiles, as well as the spread of new handsets which were effectively small computers. Mr Tercek urged the gaming industry and handset manufacturers to realise the potential crossover market for their products. The Game Developers Conference Europe runs at London's Earls Court conference centre until Friday. It is part of London Games Week, which includes a mix of industry and consumer events around the capital. Are we becoming game addicts?